Since the development of the first cash register in 1883, point of sale technology has evolved beyond the simple cash wrap to include barcode scanners, credit card processing, and mobile checkout. The evolution of such technology has morphed the traditional point of sale into a comprehensive retail management system that not only involves payment processing, but also includes inventory management, customer relationship management, and reporting to predict future trends and facilitate smart decision-making. With real-time technology used to favor big enterprises and retailers with large pocketbooks, the advent of web-based software, such as RICS, has evened the playing field for many small to medium sized retailers. 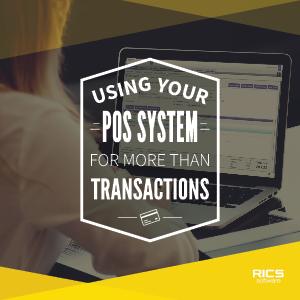 So how can you use your POS for more than just transactions.